Gallia Academy sophomore Cade Roberts (34) wraps up a Coal Grove ball carrier during the second half of a Week 7 football contest at Memorial Field in Gallipolis, Ohio. 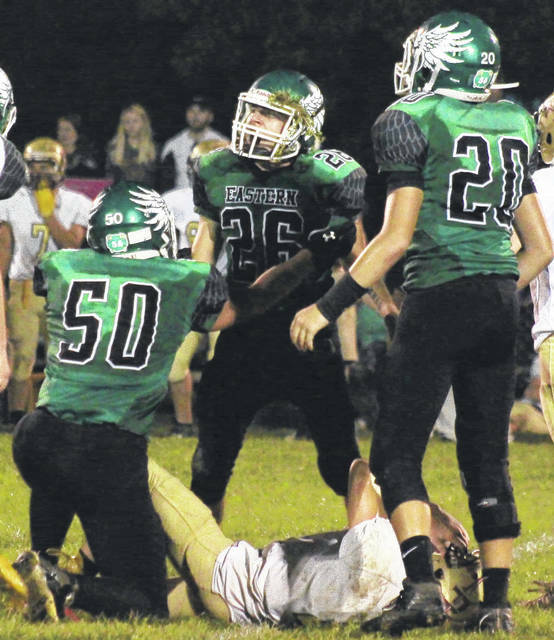 Eastern senior Daniel Harris (26) celebrates a tackle with teammates Will Oldaker (50) and Mason Dishong (20), during the Eagles’ win over Federal Hocking on Sept. 15 in Tuppers Plains, Ohio. Last Week: Waterford defeated South Gallia 56-8, in Waterford; Southern lost to Trimble 21-12, in Glouster. Last meeting between the teams: Oct. 14, 2016. Waterford won 37-7 in Waterford. SHS offense last week: 67 rushing yards, 127 passing yards. WHS offensive leaders last week: QB N/A. SHS offensive leaders last week: QB Logan Drummer 8-19-0 127 yards, 2TDs; RB Dylan Smith 13 carries, 76 yards; WR Dylan Smith 4 receptions, 46 yards. SHS defense last week: 248 rushing yards, 6 passing yards. 1. Waterford’s last trip to Racine was on Oct. 16, 2015 and resulted in a 30-20 WHS victory. The Wildcats are 16-5 against SHS in the last 21 meetings between the teams. 2. The Tornadoes are looking to stay perfect in Racine, as they enter Week 7 with a 3-0 home record. SHS has outscored its three previous guests by a combined 108-to-35. Regardless of the outcome, Southern will finish with a winning record at Rodger Lee Adams Field for the second straight year. 3. The Purple and Gold are certainly starting on the right foot, having scored 92 points in the first quarter and 159 in the first half this season. Southern has only allowed 20 points in the opening stanza and 52 prior to halftime. 4. In the Region 27 playoff ratings, Waterford is currently fourth and one of five 6-1 teams. Southern, one of six 5-2 teams, is rated 10th, two places out of the final postseason spot. 5. To this point in the season, both SHS and WHS have faced Miller, Wahama, Trimble and Frontier. Waterford defeated all four opponents, by an average of 19.4 points per game. Southern was 2-2 against those four teams, topping FHS and WHS by an average of 23.5 points, while falling to THS and MHS by a 15.5 points. Last Week: Eastern lost to Wahama 33-12, in Tuppers Plains; Trimble defeated Southern 21-12, in Glouster. Last meeting between the teams: Oct. 14, 2016. Trimble won 34-0 in Tuppers Plains. Current head-to-head streak: Trimble has won 17 straight. EHS offense last week: 84 rushing yards, 94 passing yards. THS offense last week: 248 rushing yards, 6 passing yards. EHS offensive leaders last week: QB Nate Durst 9-23-1 94 yards, 1TD; RB Nate Durst 8 carries, 54 yards, 1TD; WR Noah Browning 3 receptions, 43 yards. THS offensive leaders last week: QB Cameron Kittle 1-2-0 6 yards; RB Max Hooper 20 carries, 132 yards, 1TD; WR Max Hooper 1 reception, 6 yards. EHS defense last week: 302 rushing yards, 0 passing yards. THS defense last week: 67 rushing yards, 127 passing yards. 1. Eastern last defeated Trimble in Week 6 of the 2000 season, by a 34-6 final. The Tomcats are 17-0 against EHS since then, including a 2001 postseason matchup. The Eagles’ last trip to Glouster was on Oct. 16 2015 and resulted in a 75-12 Tomcats win. 2. The Eagles enter their fourth road game of the year with a 2-1 record away from East Shade River Stadium. An EHS win will secure Eastern’s first winning road record since 2014. This is Trimble’s final home game and the Tomcats enter with a 3-1 record in Glouster this fall. 3. Through seven weeks, Eastern has outgained opponents by a 1,639-to-1,404 in total offense, with a 600-to-324 edge in passing yards. EHS has only allowed two 100-plus yard passing performances this fall. 4. In the Region 27 playoff ratings, the Tomcats are currently fifth, while Eastern is 18th. A total of 12 of the 27 teams in the region enter Week 8 with a winning record. EHS is among six 3-4 teams in the region. 5. To this point in the season, both teams have faced Miller, South Gallia, Wahama and Waterford. The Wildcats defeated both teams, winning by 28 over Trimble and by 27 over EHS. Trimble defeated the other three teams by an average of 35.3 points. EHS lost to Wahama and Miller by 21 and 30 points respectively, while claiming a 20-point win over SGHS. 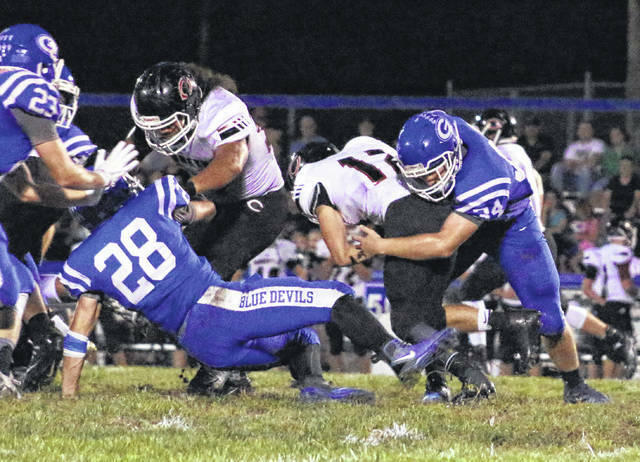 Last Week: Gallia Academy lost to Coal Grove 33-20, in Gallipolis; Rock Hill lost to Ironton 34-7, in Ironton. Last meeting between the teams: Oct. 14, 2016. Rock Hill won 51-13 in Gallipolis. Current head-to-head streak: Rock Hill has won 1 straight. GAHS offense last week: 81 rushing yards, 217 passing yards. RHHS offense last week: 69 rushing yards, 42 passing yards. GAHS offensive leaders last week: QB Justin McClelland 15-22-0 217 yards, 1TD; RB Boo Pullins 19 carries, 49 yards, 1TD; WR John Stout 6 receptions, 63 yards. RHHS offensive leaders last week: QB Brayden Friend 1-6-2 42 yards; RB Zac Adkins 5 carries, 32 yards; WR Jaret Bacon 1 reception 42 yards. GAHS defense last week: 338 rushing yards, 81 passing yards. RHHS defense last week: 227 rushing yards, 115 passing yards. 1. Last season’s RHHS victory was Rock Hill’s first over Gallia Academy since 1978. The Blue Devils have lost their last trips to Lawrence County, having not won there since a 55-37 triumph at Fairland on Sept. 12, 2014. 2. Gallia Academy is 1-2 away from home this season, while Rock Hill is 2-2 at home. The Redmen have five game at home this fall, as they will host Coal Grove on Week 10. GAHS will have its fifth and final road game in Week 10 at South Point. 3. The GAHS offense is averaging 290.7 yards per game, including 209.7 on the ground. However, The Blue Devils have surrendered 334.7 yards per game, including 234.4 on the ground. GAHS is unbeaten this year when rushing for at least 230 yards and winless when failing to reach that mark. 4. Gallia Academy is currently 13th in the Region 15 playoff ratings and is one of five 3-4 teams. In Region 19, Rock Hill is 22nd and one of 14 sub-.500 teams. 5. To this point in the season, the only two common opponents for GAHS and RHHS are Fairland and Portsmouth. The Dragons beat the Blue Devils by a 17-point margin, while earning a seven-point win over Rock Hill. PHS defeated the Redmen by three points, but lost to GAHS by one. Last Week: River Valley defeated Alexander 27-15, in Bidwell; Vinton County defeated Federal Hocking 48-8, McArthur. Last meeting between the teams: Oct. 14, 2016. River Valley won 41-6 in McArthur. RVHS offense last week: 211 rushing yards, 127 passing yards. VCHS offense last week: N/A. RVHS offensive leaders last week: QB Patrick Brown 6-11-0 127 yards, 2TDs; RB Patrick Brown 13 carries, 96 yards; WR Layne Fitch 3 receptions, 74 yards, 1TD. RVHS defense last week: 154 rushing yards, 48 passing yards. 1. The Raiders’ last visited Vinton County on Oct. 16, 2015 and won by a 30-12 final. Since joining the TVC Ohio in 2014, River Valley 3-0 against VCHS, winning by an average of 18.7 points per game. Vinton County is the only one of the six other league teams not to defeat the Raiders in league play. 2. This is the fourth of River Valley’s five road games this season. The Raiders have won one of their previous three away contests and will need to win on Friday to avoid finishing with a losing road mark for the first time since 2014. 3. Through seven games, River Valley has gained 1,985 yards of total offense, including 1,045 through the air. The Raider defense has allowed 2,682 yards this year, with 1,806 of those coming on the ground. RVHS has scored 18 touchdowns, while allowing 28 this fall. 4. Both Vinton County and River Valley enter Week 8 rated 17th in their respective regions. The Vikings are one of 15 teams in Region 15 with a sub-.500 record, while RVHS is one of 14 teams under .500 in Region 19. A total of eight teams in Region 19 enter Week 8 with a 3-4 mark. 5. The only two common opponents for VCHS and RVHS to this point in season are Meigs and Alexander. The Marauders defeated both teams, River Valley by 17 points and Vinton County by seven points. Meanwhile, the Spartans lost to RVHS by 12 and VCHS by 28.